Sports galaxy is one of its kind sports training facility known for its proficiency of zealous training methods, its state of the art infrastructure and facilities. 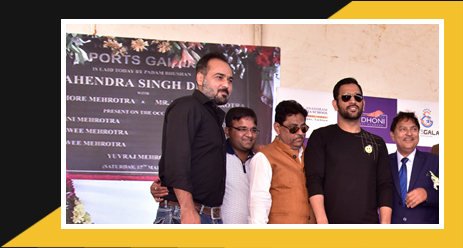 The SPORTING PROGRAM at SPORTS GALAXY BY M.S.DHONI is designed to help aspiring athletes of different games to realize their goals of becoming professional players of their chosen games. The SPORTING PROGRAM is for those aspiring athletes and students who also seek to become dynamic personalities as well as professional sports person. In this program the student seeks admission to the in-campus school "seth anandram jaipuria school, alambagh campus" which will look after the academic needs and after school hours they are the part of SPORTS GALAXY by M.S.DHONI where they can get trained in their specific sports . The sporting program is commencing with cricket in its first year with other sports following up from the second year.